After my last post, I was all set to make fun of my next book's title, The 7 Habits of Highly Effective People, by Stephen R. Covey, because, who is he kidding? He's saying "effective," but meaning "Successful," and success means.....etc., etc., etc. 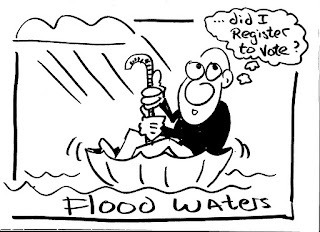 Please see my previous post, etc, etc, and we are simply talking in euphemisms. That was going to be the gist of my argument. Except a couple of my tens of readers, the husband and my faithful reader Scrollwork,* commented that I seemed to have overlooked a wee part of the dictionary's definition of success. The part of the definition that says that success, n., is the achievement of intention; the achievement of something desired, planned, or attempted. Hmm. Well, yes, now that I look a little more closely, I have to admit they are right. And that this definition does not actually have anything to do with wealth, status, or money per se. That I overlooked this aspect of the definition says a lot more about my mindset than anything else, I suppose. Or about my reading comprehension skills. So I am forced to face up to Stephen R. Covey and his 7 Habits and not make fun of his so-called euphemism. I am forced to admit that Effective can actually be a synonym for Successful. And I am forced to examine more than the title of this book, which several reputable people who aren't at all pretentious have recommended to me. Why make fun of it in the first place, you might ask? It is an international bestsellar, after all. Why? Because I'm intimidated, of course. This is one of those daunting books that say, Look, here are 7 simple rules for being successful, and all you have to do is all this scary stuff about evaluating yourself and your behavior and your values and your principles, your goals, your motivations, your psychological hangups, and pretty much everything else that your life has been carefully constructed to obscure -- and you have no chance of really understanding without therapy. But it costs about $16 plus tax, and one session with a paid professional is at least 10 times that, so--might as well give it a shot. Be pro-active, as opposed to re-active. Take charge of your behavior. Don't let things happen to you because you are passive. Your circle of concern is all the stuff that is on your mind, and the smaller circle is the stuff over which you have some control. So you worry about global warming, but you can't control that. What you can do is drive less and walk more. Or you worry that you're going to get all flabby and old and wrinkly and then die; but what you can do is starve yourself, get Botox, and exercise like hell. And eventually die. So focus on today (Geesh, this sounds familiar), and what you can do today to further your goals. Like make that appointment for that Botox. Some things within your Circle of Influence: yourself; being happy; being a good listener; admitting mistakes; setting goals and following through. Some things within your Circle of Concern: the weather; mistakes; other people's flaws and annoying habits. Covey has a nice coda to his chapter, a little lesson about a stick. On p.21 he says, "'When we pick up one end of the stick, we pick up the other.'" He means that you can choose your response to a situation, but you can't choose the consequence. The consequence is outside our Circle of Influence. There's no way around this, he says. If you cut off the end of the stick, you've still got two ends, the one you're holding, and the other one, the consequence, that you can't control. So this is a nice way to try to deal with control: that which you can control, that which you can't. The truth is that there's not too much you can actually control, beyond your own responses. (And some of those are involuntary.) Which realization is quite anxiety-provoking, don't you think? And anxiety is at the root of it all, whether you're a nail-biter or a control freak. Anxiety is just another way of trying to control the uncontrollable, through such magical thinking as, If I worry obsessively about every single thing that could go wrong, then nothing will go wrong. But if I forget just one little thing, all bets are off. So I'm afraid to say it, but the best thing to do here is to take deep breath and try to relax, then make a choice, and then another breath and another choice. That is within your Circle of Influence. The good news, according to Covey, is that the more proactive you are in your life, the larger your Circle of Influence becomes. And also, if you have a dog, you can toss the stick to him, and he'll chew it to bits. *Scrollwork, by the way, has an Etsy shop where she sells fantastical, "upcycled" clothes that, if I were 25 years younger and lived farther east, or south, or definitely west, I'd be happy to pair with some Dr. Martens and wear dancing. 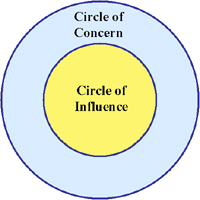 I'm inclined to think that as I manage to expand my Circle of Influence, my Circle of Concern would fade into the mist. Not to the point of non-existence, just fuzziness. But maybe my oldest sis was right to call me a Pollyanna. Sending virtual bouquets of South African protea for the astonishing backlinks to my blog and shop. Just the thought of you entertaining the fantasy of dancing in my designs has sent me to the moon. And Doc Martens? Why didn't I think of that? I must hasten to design and model future fabric concoctions paired with my one and only pair—white, with flocked black damask. Additionally—it never occurred to me to be intimidated by the stuff people like Covey put out. Maybe because I'm so snooty I think, "Doubt it will work for me." Or else I've seen so many of these lists and have checked that I do each item already but have yet to see results on the spectacular level. I really enjoyed reading this article-especially because my friend at Etsy recommended it. I have always wanted to read that book! (The Seven Habits...) but been intimidated to do so. Too much deep thinking. Now in retirement I have more time to think, I have been focusing on these personal things that I can do to improve my life-and it's working! I believe we are all reactive to some things at some times but we have much more control than previously realized. Keeping this forward in my thinking has helped to make me proactive and more "successful" in life! @Anonymous, thanks for stopping by. I will be writing about the other 6 Habits, too. So check back! It's good to know that as I age, I may feel more in control of my reactions. Actually, I do. I am. Already. That is a good thing about maturing. @Scrollwork, you are welcome. I will have to Google South African Protea--not much of a gardener--after I finish dropping off child at school dance. @Scrollwork, yes, at least $160. I actually hesitated writing that because the price seemed, well, low. But clearly, you don't need it, if you can envision your circle of concern merging into your circle of influence.